I’ve always thought that Haaretz opinion editorials are proof, if you required more than the empirical studies done, that Israel is a democracy. The vile contempt that most of the left-of-centre columnists and writers show for Israel is truly a tribute to the cornerstone attribute of any civilised society: freedom of speech. The news that eight Palestinian children had died in a bus crash is a tragedy to any decent-minded person. A sad loss of life believed to be because of adverse driving conditions. For Gideon Levy, rather than sharing in the tragedy of the day’s events, it was a golden opportunity to stare into his crystal ball. Levy’s entire article is a crass condemnation of Israeli society’s supposed reaction to the bus crash. “Relax, these are Palestinian children,” Benny Dazanashvili wrote on Twitter. To which Tal Biton responded, “It seems these are Palestinians … God willing”. 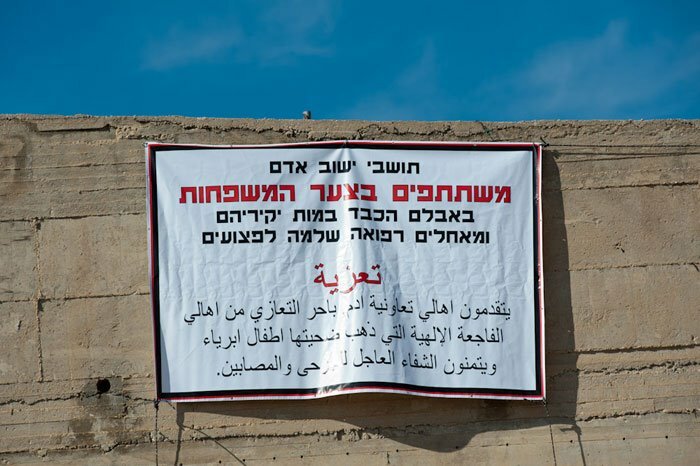 In a heartwarming show of solidarity, settlers have erected a sign over the crash site expressing their sadness and grief. This isn’t the product of some cosmopolitian Tel Aviv human rights group but of one group of settlers sharing their grief with the Palestinian people. If you ever needed evidence that the settler community aren’t a bunch of rabid, blood-lust devils then here it is. I wonder what banned CiF poster “William Bapthorpe” would say about that sign? Not that I really care, of course. Of course the obvious riposte to the closing question/statement is that one sign showing humanity and good-will no more represents the zeitgeist in Israel than a handful of offensive tweets. Unfortunately, it is undeniable that anti-Arab racism exists in Israel – although its depth and breadth is certainly a topic for debate. I am not excusing those (like the tweeters who seem to be happy at the deaths of children) but frankly, it would be absolutely shocking if that were not the case in a society that has lived under existential threat from its Arab neighbours for longer than the last 64 years. Compare this to the levels of, say, anti-German opinion in Britain for decades after the end of WWII (many older Brits still wouldn’t dream of buying a German car, for instance), or anti-Argentinian rhetoric at the time of the Falklands War in 1982 (when Britain itself was under no threat whatsoever from the “enemy” let alone the threat of utter destruction that faces Israel), and it is remarkable how relatively tolerant, free and liberal Israel is. It certainly compares very favourably with the levels of anti-Israeli (and antisemitic) activity not only in the “occupied” territories but also in the wider Arab world. I for one am proud of Israel’s admirable record on this front and believe it to be a cause of celebration rather than criticism. Also, as Yaakov Lozowick pointed out in his book “The right to exist”, Israel managed to maintain her democratic institutions and the rule of law throughout her existences, in spite of the constant existencial threats. Another admirable record, better than many Western democracies. As for the islamic paradises…well, as the prototypical post-modern cultural relativistic progressives, they are “different”, aren´t day? We can´t compare their record with Western standards of human well-being, human rights, freedom and development. In plain words, they´re barbarians. How much of it is truly racism, and how much the cause-based hatred resulting from having grown up in the reality of terrorist attacks? Despite the Far Left’s custom of using the R-word for both cases, there is a difference. When an failed Arab suicide-murderer treated in an Israeli hospital still has no regrets about what he tried to do, you know the hatred is not cause-based but existential. Contrast this to the willingness of very many Israeli Jews to forgive all the past hostilities with Egypt upon Sadat’s arrival at the Knesset. No, there is no equivalence. Even seemingly bigoted pronouncements by Jews that “Arabs can’t be trusted” are easily explained as being driven by the circumstances, while the hatred on the other side runs so deep as to destroy their own sustenance (like the Gaza greenhouses in August 2005) and raise their own children to aspire to suicide-murder. As usual, the anti-Zionist finger-waggers are either deceptive or deceived. ziontruth – How much of it is truly racism, and how much the cause-based hatred resulting from having grown up in the reality of terrorist attacks? Despite the Far Left’s custom of using the R-word for both cases, there is a difference. Yes there is a difference. But, it cannot be denied that there is a substantial amount of real racism against Arabs and other ‘ethnic’ groups in certain sections of Israeli society. All of it on the ‘right’ of the political spectrum which includes religious groups some of who are hostile to their children being educated in the presence of Ethiopian Jews. It should not be exaggerated but Israel is not entirely free from racism. But then I cannot think of any country that is. It’s a complicated thing. You’ve got ‘real racism’, truly race-based hostility toward Arabs, toward Jews from various backgrounds, toward the gentile African immigrants…there’s that to deal with. Then you’ve got hostility that develops from the tension in the region, and the unrelenting political situation, which isn’t racist at its core, but can easily be glommed onto by racist ideas. And then, on top of all of that, you’ve got the specific distrust and wariness I see especially in older Mizrahim and Sephardim, many of whom grew up in Arab countries where they faced substantial bigotry aimed against them as Jews. It reminds me of the guardedness many older black Americans have about white people. Individual relationships may be warm, but there’s a general distrust based on history and personal knowledge. None of this is surprising, though. As you say, no country is free of racism, perhaps least of all one that is so culturally diverse and historically complex. Sorry,that was meant to be ‘ever’, not ‘every’. Kindly refrain from lumping anti-Arab sentiment and the deplorable discrimination against Ethiopian Jews. They’re not the same thing. Ethiopian Jews are part of the Jewish nation, that’s why racist sentiments against them are deplorable. Anti-Arab hatred, on the other hand, is an understandable and healthy reaction on the part of the Jewish nation to the hostility to another nation, an enemy nation that has genocidal designs on all the Jews living in the Land of Israel (and beyond, cf. Mumbai). Racism against the Ethiopians needs to be dealt with—preferably exclusively within Israeli Jewish society, with the anti-Zionist worldwide mainstream media outlets shut out from the entire discussion (because of the malicious ax to grind they have). Anti-Arab feeling, in contrast, only demonstrates the sanity of the Jewish people in Israel; if such sentiment did not exist after everything the Arab imperialists have done to us, that would be cause for worry. Racism is bad, but over the past years I’ve come to the conclusion that the Race Industry grown round the business of policing “correct racial thinking” is far worse. The greatest perpetrators of race-hatred today—and this I know from what’s going on in the United States of America—are the opportunists who make political hay out of incidents, many of them spurious. I don’t want discrimination against any group in Israeli Jewish society, but neither do I want discrimination for any group. The U.S. of A. has had its fill of such discrimination with the zero-talent, anti-American hippie-child it seated in the White House. The race of a president or other official should not matter any more than that of a brain surgeon—only competence should matter. Unfortunately Adam, in the immediate wake of the crash there was at least one egregiously awful example of racist hatemongering from a woman purporting to be a Jewish Israeli i. She wrote something so nasty in the comment thread below the story which appeared in ‘The Times of Israel’ that many people felt constrained to rebuke her harshly. It was only afterwards that I did a double think and now believe it was written pseudonymously by someone bent on stirring up trouble. Can anyone else throw some light on this? You make a good and valid point, Natalie. There is no way of knowing the true identity of posters on blogs, social networking sites or below the line on news websites, so it is fairly easy to pose as someone or something you are not, and journalists and others ought to consider (or at least acknowledge) this uncertainty before making points based on the identity of such people. This having been said, I am certain that there are some in Israel (and indeed in other countries, including the UK) who would share the views of “i” and the two tweeters quoted by Ha’Aretz. The irony that gets me is that poor-quality journalists like Gideon Levy, along with his fellow piece of work, such as Amira Haas, are able to make a living in Israel demonizing and bashing the country. Meanwhile, very many people who are loyal to the country and have underutilized skills struggle just to get by. Gideon Levy is a pitiful miserable sour person who’s face would crack if he ever attempted to smile.Haaretz is competing with the Guardian to see who is more anti-Israeli. Every nasty anti-Israel commenter quotes Haaretz,to give credibility to their anti-Israeli diatribes. I love Steven Plaut’s description of Ha’aretz: “the Palestinian newspaper printed in Hebrew“.